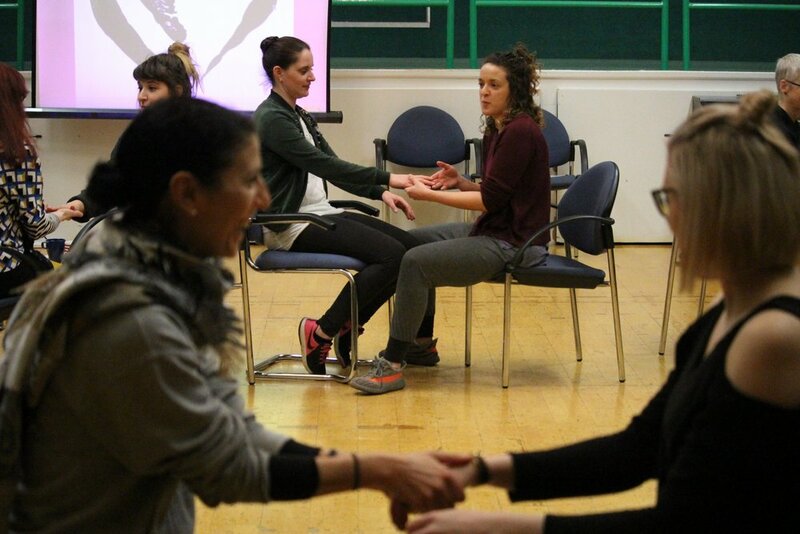 Powys Dance recently played host to delegates from across Wales for a CPD day organised by The Wales Wide Training Programme and Network - which is a consortium of community dance organisations in Wales that programme training for the dance practitioners we work with. 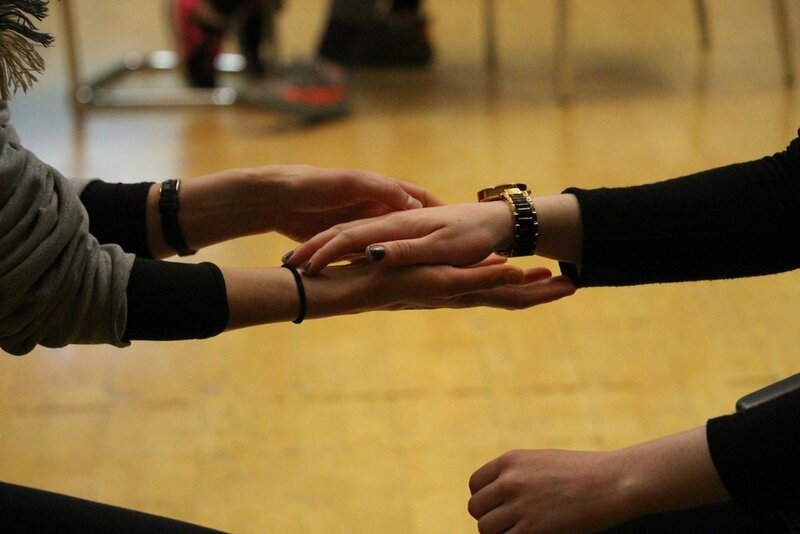 The day focussed on dance for the over 50's and how we can challenge, create and inspire with older participants. 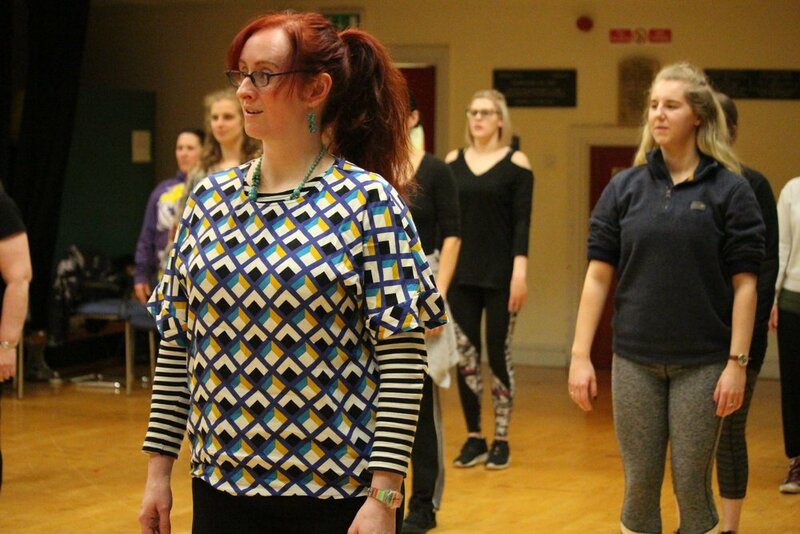 One of our lovely freelance dance leaders Helen, or 'Helly' as some of you may know her, attended the day and has given her humorous and thought provoking insight on it, written with jollity and passion we couldn't help but share! I was so delighted to be offered a free place for this day and pleased that I took up that offer. As a freelance practitioner the cost of a course can often be a disincentive – the cost has to be weighed against the earning potential along with the benefits to my practice. This is also a subject close to my heart as I am becoming (okay already am) one of a growing number of older people. My own work has also gravitated towards the “older” organically – as I connect with and can relate to a certain age and time of life. My birth certificate informs me I am nearly 56 but on the inside I feel young but with a lot of hindsight and life experience. My hips and knees tend to disagree. Living and working within a rural area means it’s easy to become isolated and insular so days like these are really important to connect with other practitioners, to give and receive support and inspiration. To be reminded that we are not alone. 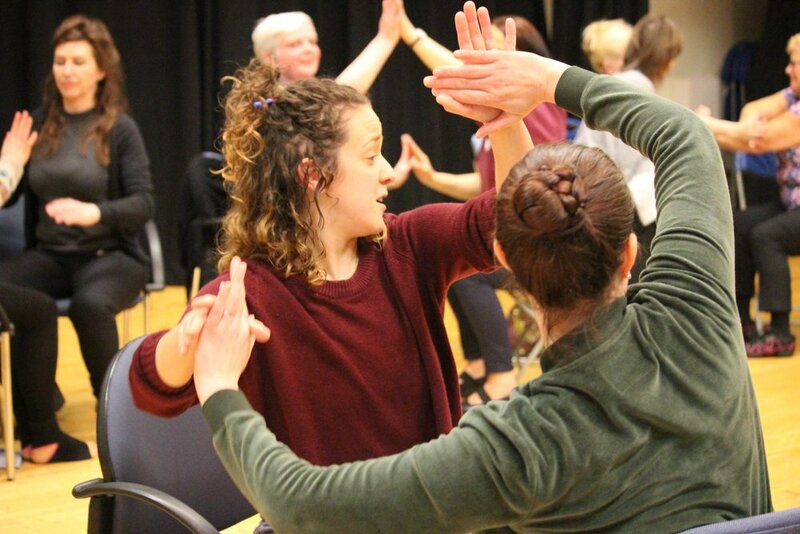 The topic of dance for older for people covers a wide area and the presentations covered this both geographically across Wales and through their contents. We were taken on a journey that took us to an over 50s dance group, to work with the elderly and those with various stages of dementia, from those in care homes, to those in the community, to a lady of grace and eloquence of 104 years. The stand out presentation for me was that of the cARTfreu Project. Emma Robinson first gave us the background of the work that continues to evolve and looks across the whole area of support for staff within the homes and very importantly support for the artists as their work can have an adverse affect on their emotional wellbeing. Emma also spoke of the practical approach that the artists use to build connections between themselves and the participants and also between different homes. Emma also spoke that their approach was not necessarily that of reminiscing but looking into the now, of being in the moment and the future. A pertinent reminder that as we age we are not just beings with a past but we are dealing with the current moment and may still have wishes and hopes for the future. This was followed by a practical seated session led by the awesome Emma Thomas. Prior to the session she confided that she had been nervous of leading a group of her esteemed peers – they can be the hardest crowd to play to – but in this instance no worries. Emma led an interesting and inspirational session that I will definitely be able to use as a launch pad within my own sessions. From the music to the content to her engaging warm personality that shone through – she had us all in the palm of her hands! The day began with Jemma giving us a presentation on the work of Dawns Powys Dance with older people. Some of this work was carried out prior to Jemma working with DPD – for me it was a trip down memory lane! Following this we were taken on a trip around the country with presentations from Alyson Pugh and Lizzie Davies covering their Falls Prevention Programme within the community. We know that falls are killers – not necessarily immediately but the long term impacts. Alyson spoke of the practicalities of setting up the groups they work with – how to reach out in particular to the lonely and isolated. The logistics of dealing with large numbers and paying attention to gender impartiality within a group so as not to put off any gentlemen that attends. Although factual and practical it was delivered with warm anecdotal illustrations that brought home the importance of such work. Lizzie then spoke of the special training she and her colleagues have undertaken so that attendees are having real physical issues addressed and not just the enjoyment and emotional benefits. Paul Whittaker presented his film of the work of Bethan Ryland that is part of her studies and research into her work into the benefits of dance within care homes. We were not the target audience of this film as Bethan went through the process of evidencing the benefits of her work through interviews with staff, relatives, and participants. This led to a discussion with Paul on filmmaking and how in collaboration you need to have a clear perception of what you are trying to achieve so the end product reflects your intentions. The final presentation prior to lunch was from Dawns i Bawb which also included a taste of their interactive performance – currently work in progress. Catherine gave us the context and background along with funding struggles, collating evidence of the benefits. Catherine had a refreshing honesty in her appraisal of previous incarnations of the project – both positive and negative and how they’d realised that when they took themselves too seriously and became too abstract they lost connection with participants – after all if you’re not enjoying it you won’t want to go back for more. A delicious (and healthy) lunch was accompanied by a delightful beautiful film of Eva’s starring a lady of 104 years – poignant and emotional, reminding us that at whatever age we are sentient beings. Post lunch we were revived by the double Emma’s and rounded off the day with a practical session with Senior Momentum. A group of over 50s that meet regularly at the Dance Centre led by Carolyn Keown who put us through our paces while bringing out the Jets and Sharks in us!! So overall what will I take away from this day? The struggle for funding continues, with organisations continually looking for ways to evidence their work and validate their existence. The great work being carried out across Wales, by inspirational and devoted people. The day focused more on the more elderly and those in homes, those with dementia and the vulnerable. The new over 50s have very different needs. We are products of the feminist movement, sexual liberation, juggling careers, children and grandchildren. For those of my age we must never underestimate the mental and physical benefits of a good wiggle and a laugh. If it means we’re dancing, feeling good about ourselves and working those muscles that we will require for those hip and knee replacements – that’s got to be a good thing. I’d rather be wiggling than dusting!! This day just reinforces how important the WWTP days are – a mutual forum for problem sharing and solving, building a picture, learning, connecting, and reinforcing good practice, inspiration and support. Thank you Tracey, Rubicon and WWTP!